When it comes to fine craftsmanship, whether it's in a homes architecture or in it's furnishings, there a varying ways to highlight intricate design. Some prefer a subtle approach, adding lots of layers to the design so that it gently takes you in, and others prefer the more direct approach, pairing down so much so that it strikes you in awe. 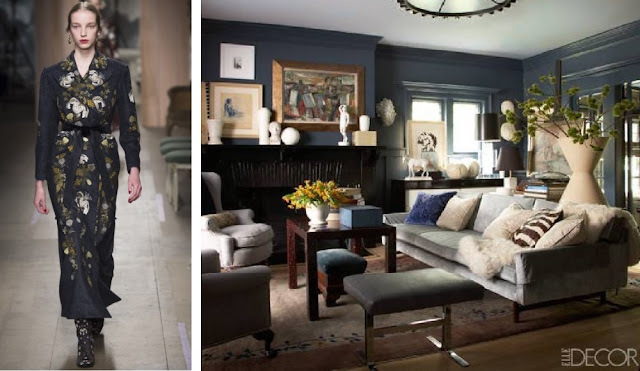 And then there is Florida based Interior Designer Leah Richardson, who seems to have found the place between subtle and striking. Her Paired down style is brilliant, as she layers neutrals and compliments with rich wood tones. Furniture and fixtures don't compete with this homes incredible architecture. 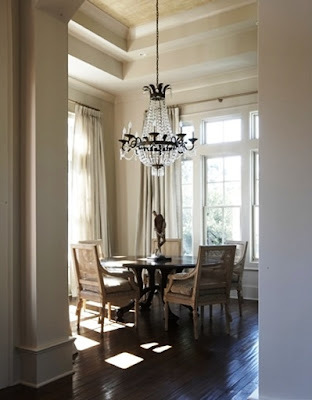 The light fixture below perfectly raises your eye to the coffered ceiling. The dining table is lovely with it's dark rich tone almost blending in with the flooring and co-ordinated with pale wood dining chairs. 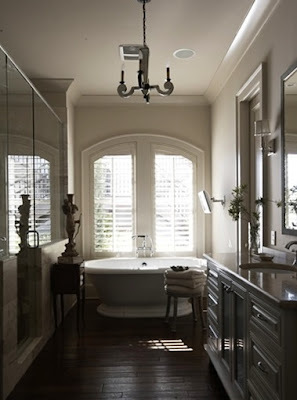 A luxurious freestanding bath, set in front of french doors that lead outside. Beautiful flooring, incredible vanity, and plenty of mood lighting, including the drop down ceiling fixture and sconces flanking the vanity mirror. What an inviting start to the day. 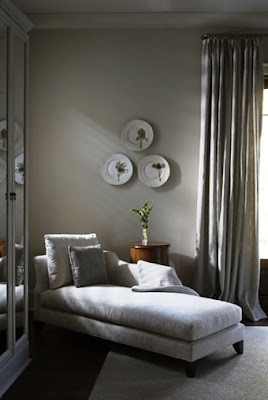 Relaxed Bedding and Window coverings with soft gray accents for a little trendy update. 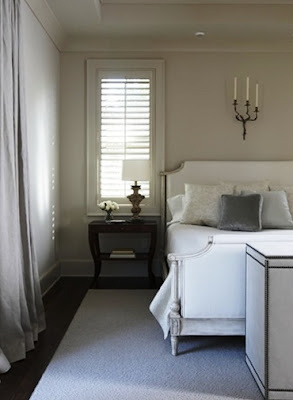 Interesting choice for decor above the bed, taper candled wall sconce, that add a romantic ambiance. 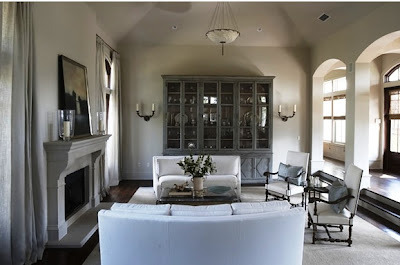 In seating area below, trio of painted plates is a quirky touch to a reading nook. 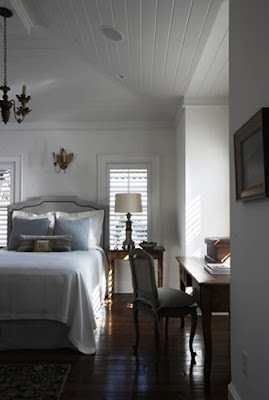 In the master bedroom, placing a little bit of weight in the light fixtures draws your eye upwards to the vaulted and panelled ceiling. 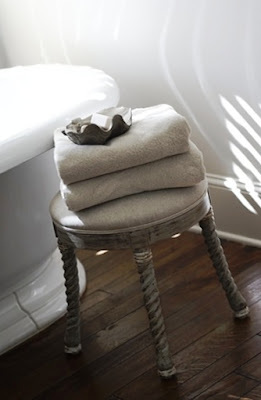 A minimal use of area rugs creates a very polished look, while neutral bedding is warm and inviting. 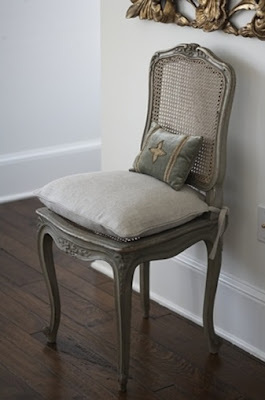 A wonderful mix of antique gold, and satin silver accents add so much character. This home is just a pleasure to absorb. 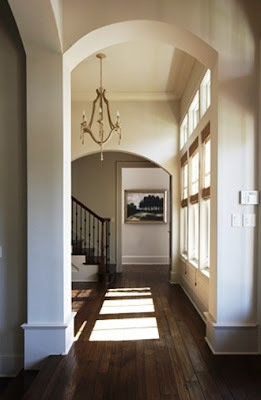 The antique lighting, exceptional height of each room and the details overheard, rich dark floors that are barely covered, and really beautiful choices for furniture. All set against layers of cool white walls, and textiles, that are a perfect canvas for the sophisticated design of this home. You can see more fabulous work from Leah Richardson here.